Your Body Clock affects your Sleep, Mood & Energy. 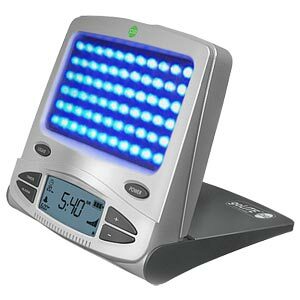 For decades, doctors have recommended light therapy for treating mood and sleep problems. This is because a center in your brain's hypothalamus (called the body clock) uses the light found in natural sunlight to regulate sleep, wake and energy cycles. If you struggle with sleep, mood or energy, your body clock may not be responding properly to normal light signals. You can Manage your Body Clock. When your body clock gets the right type of light, it produces active, energetic hormones like serotonin and suppresses the negative, withdrawal ones. When your Body Clock doesn't get the right type of light, it can make you feel tired, moody, and sluggish. The right type of light will reset your sleep, mood and energy cycles, so you can sleep better at night and feel great during the day. Your Body Clock Responds Best to Blue Light. Researchers have discovered that our brains respond best to a specific bandwidth of blue light (470 nm) found in natural sunlight. Apollo Health has isolated this bandwidth in a new technology called BLUEWAVE®, which is twice as effective as white light therapy**. The goLITE® uses BLUEWAVE® technology to provide your Body Clock with all the benefits of natural sunlight without the harmful effects of UV and other rays. Easier than it Sounds. For nearly 20 years, Apollo Health's Body Clock System™ has helped hundreds of thousands of people take control of their Body Clocks. Try the goLITE® P2 today and let us help you Sleep Better, Wake Refreshed, Have More Energy, and Improve Your Mood™. Use your goLITE® to reset your body's sleep/wake cycles. This will help restore your healthy sleep patterns in just a few days. Start your mornings with your goLITE®, and see how easy it is to get going. A few minutes a day is all it takes. Like natural sunlight, your goLITE® provides specialized light that is more powerful than energy supplements because it directly boosts the active energetic hormones while suppressing neurotransmitters that cause you to slow down and lose energy. You know that sunlight can be exhilarating. Your goLITE® can help you feel the same way, by providing the specialized light signals that are so important to helping you regulate your mood. Are you one of the many who suffer from winter blues: Light therapy is clinically-proven treatment for this common malady caused by light deprivation during the shortened fall & winter months. Your goLITE® can help you enjoy that time of year. Adjusting to a new time zone can be difficult, especially if you travel frequently The goLITE® can quickly shift your internal body clock, so you can hit the ground running and make the most of your work and hard0earned vacation time. The goLITE's® included international power adapter works all over the world. If you work odd hours, you know that you often receive conflicting light signals, which can confuse your Body Clock. The goLITE® can help you sleep better, feel more energetic during work hours, and get more out of your social if when you're off the clock. It produces 100% of the recommended blue light for maximum benefit. BLUEWAVE® technology delivers the most technologically-advanced treatment available, so you’ll get the best results in the shortest time. We've been building the world's best light boxes for more than two decades. For many years, the world's leading light therapy researchers and doctors have known that full-spectrum, 10,000 lux light boxes can be very effective at treating seasonal affective disorder and other circadian rhythm related mood disorders. They also know that no one does 10,000 lux better than Apollo Health, which is why we're the world's most-recommended, best-selling brand. Now we're building the world's best blue spectrum light therapy device. Recently, researchers have discovered that a very specific range of blue light is the most effective color (wavelength) in treating these disorders. Apollo has spent the last several years working with leading experts to develop our innovative line of BLUEWAVE™ products. The patent-pending goLITE delivers only the most effective wavelengths, which means a more convenient treatment, and fewer side effects than traditional 10,000 lux full-spectrum light therapy devices. BLUEWAVE™ is so significant because it provides a higher effective response than most full spectrum light at 1/10th the intensity 10,000-lux. This means light therapy is not only convenient but easier on the eyes with fewer side effects. Because BLUEWAVE™ is so effective, all of our BRITEWAVE™ products have also been upgraded with BLUEWAVE™ technology. Indeed, BLUEWAVE™ is the technology of the future. Although other light sources, including 10,000 lux, contain more blue than the goLITE®, the majority of their spectral energy is counterproductive. Eliminating these unnecessary wavelengths increases effectiveness and significantly reduces overall intensity. Because BLUEWAVE™ represents only a narrow slice of the visible light spectrum, it cannot be measured accurately with a lux meter. Lux meters measure the total spectral energy from all visible wavelengths, not specific bandwidths. This is why BLUEWAVE™ intensity is measured in photons/cm instead of in lux. Many light therapy companies make false claims regarding their products' performance and safety. Apollo has participated in more research than all other light therapy companies combined. In fact, most of our competitors quote research conducted with Apollo lights. You should verify any claims made by any company selling light therapy devices. Many of our competitors claim to be "#1", or to have safe and effective products. Ask them to prove it! Apollo Health, Inc. supports and funds more research on the health benefits of light than all other manufacturers of light therapy products combined. We have consistently led the way in light therapy research, administering millions of dollars worth of grants to pinpoint the positive and therapeutic effects of light for the treatment of mood disorders, insomnia, skin conditions, and blood ailments. Because of Apollo's history, credibility, and dedication to the improvement of people's lives, we have been the recipient of numerous government research grants. In our quest to bring about the best possible natural solutions, Apollo Light has worked with most major research centers as well as hundreds of physicians and researchers to increase the effectiveness and awareness of light therapy. Apollo Health has provided light therapy products to the National Institute of Health, NASA, Yale, the Mayo Clinic, and dozens of research institutions around the world. Following is just a small amount of the research that has been done on light therapy for Seasonal Affective Disorder, circadian rhythm disorder and other mood and sleep related issues. There are numerous whistles to warn a critical person that this is another case of market-place forces and religious belief supporting alternative medicine. There is a body of evidence which suggest that light effects mood. This is tied to the level of serotonin and of melatonin, and the circadian rhythm, which melatonin levels affect. Around two decades ago articles in the media based on the work of psychologists suggest that a natural night-day rhythm in man, that natural light was better than artificial light, and that there was a decreased incidence of depression during the winter—supported by the observation that the month of December has the highest incidence of suicide. It had been known for decades prior that lower animals have various mechanism by which they maintain a daily cycle. It was reasoned that man too had such a mechanism. Evidence for this mechanism was found including a connection (retinohypothalamic tract) from the retina to the the suprachiasmatic nucleus cells in the hypothalamus. These cells are connected to the pineal gland, and it appears this connection affects the production of melatonin by the pineal gland, which peaks during the night. Thus it was theorized that disruption of this rhythm through abrupt or gradual changes could have physical and psychological effects. Among those effects were posited jet lag, fatigue, disorientation, and insomnia, and depression with its higher rate of suicide. But the research has failed to control for contravening variables. Typically it is studies of sleep deprevation and a condition where the period of sleep differs from the “normal cycle”. However placing subjects in a room for a week or more is bounjd to have effects on mood, just as incarceration does. And self-observational conclusions about jet lag similarly fail to account for contravening variables. Jet lag can be explained by the excitement and uncertainty of being in a unfamiliar location, increased consumption of caffeine, etc. There is an obvious explanation of the seasonal effects of shorter days on mood. Shorter days are associated with cold weather, which is both uncomfortable and restrict activity choices. Reduction in the number of pleasurable activity affects mood. Thus both what is done and how it feels doing things out doors are affected. These are contravening variables that most—if not all—pro-circadian rhythm researchers fail to control for. Can light be shown by itself to affect mood? Circadian rhythm is related to health. Sound sleep accelerates body repair and mental acuity improves. The brain has a system located in the suprachiasmatic nucleus (SCN), a distinct group of cells located in the hypothalamus. Nature does things for a survival purpose. Sound, longer sleep occurs in a quiet dark room. Longer, colder nights thus would promote sounder sleep. Thus one would suppose winter is good for mental and physical health. A system which promotes sound sleep would have survival advantages—if the sleep occurs in a safe place. Disturbing sound sleep does not promote health—so it seems. A blue light shone in the user’s face while he sleeps in what would have been a dark room, certainly doesn’t promote sleep: one reason to not spend money on a goLITE. Moreover, though melatonin promotes sleep, which is why the supplement is taken before retiring. Light reduces production, and blue light the most. Thus not only would the light directly disturb sleep, but indirectly through the decreasing of melatonin. Now let us consider the importance of melatonin, whose product decreases with light and peaks during sleep. There is a mountain of research which show that melatonin is salubrious. Melatonin has become a widely taken supplement. Melatonin is an antioxidant which does not undergo redox cycling, such as that occurs to vitamin C (such cycling produces free radicals), but rather results in stable end products. In addition research ahs shown that melatonin supportive of the immune system, but its role in disease treatment remains unknown. Thus Melatonin appears to be on the short list of salubrious supplements. So why shine a blue light which lowers the production of melatonin? Melatonin is good. And since sound sleep is better, why reduce it by shining a blue light in your face? The goLITE claims of positive effects is contradicted by the research which they have up on their website. Their story simply does not make sense. If something is significantly good then properly constructed studies would demonstrate it. GoLITE which has funded a couple of studies, has never attempted to quantify with proper controls the benefits of their gadget. And they haven’t show how much effect their gadget has on melatonin production. But the marketers of goLITE are not about logic and controlled studies. They want to arm consumers with the verbal material to justify their spending of $180. They want their meme to spread and produce more sales. Given the promotion by Costco, they are doing pretty darn good selling an item made in China for under $20 for over $150. Have we gone that far from the snake oil days? This reminds me another sleep gadget, one which teaches while asleep. I wonder what effect does the noise have upon REM?